ASCII Table is a utility for programmers, it is carbonised and runs under MacOS 8.6/9 and Mac OS X. I decided to write it because the System 6 style Desk Accessory, that I have been using for years, started crashing under Mac OS 9 and I couldn't find anything that ran natively under Mac OS X. 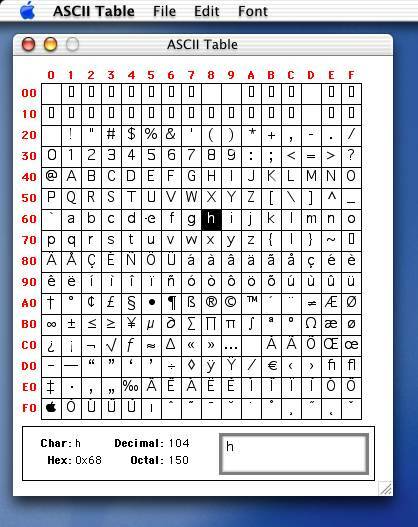 You can type characters on the keyboard and it will highlight that character on the table and display its ASCII code in decimal, hexadecimal and octal. You can also click on characters on the table which will exactly the same thing only you don't have to know the keyboard combination to type it. Characters clicked and typed are also inserted into an editable field at the bottom. This can then be copied and pasted into other Applications. You may select a different font to be displayed from the font menu in the menu bar and all the characters in that font will be displayed in the table. The table is also re-sizable so that you can view the characters at larger sizes. Stuffit Expander is required to decompress the archive.